Durham – July 2011 // For years now I have been traveling the 401 east of Toronto, and have always noticed a marsh south of the highway east of Oshawa. There, where the highway briefly dips down to the lakeshore. I figured it was part of General Motors’ land, but always wanted one day to explore it by bike. My chance came last winter, when City of Oshawa transportation staffer Karim Dewan called me to come speak about BikesandTransit.com at Oshawa’s new Bike Week this spring. I’ve built a municipal bikes and transit partnership of seven members to-date, and it’s always much easier – and appreciated, when they call you! 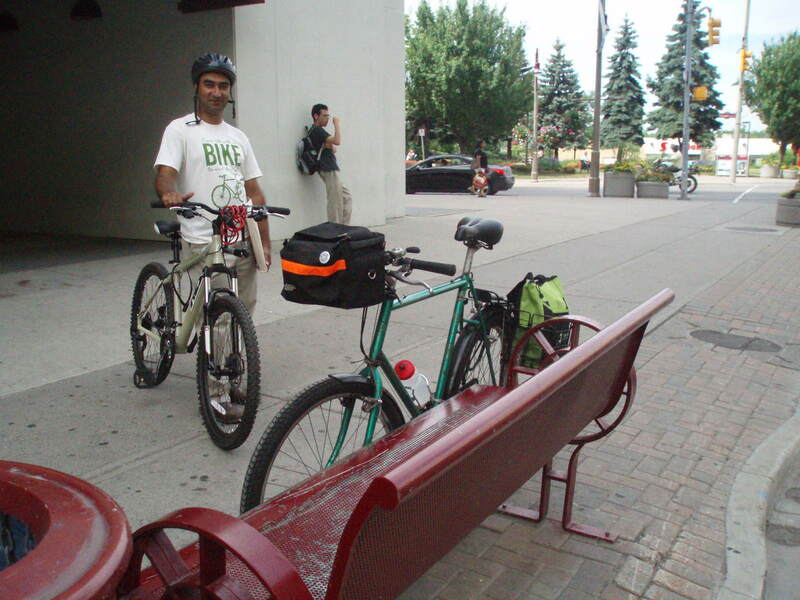 Karim and I agreed to present BikesandTransit.com to Oshawa in the spring. I did, and here we are, sharing another “jewel of Durham cycling” – Oshawa’s creek and waterfront. Even though I have mapped and profiled 14 previous bikes and transit excursions, from Whitby all the way around to Grimsby, this one has the rare bike, train and bus combo. I was excited to try this one, since the other two (McMaster and Ajax North) do not start you off smack dab in the downtown of a major city. According to GOTransit.com, google maps and online Oshawa bike maps, I was about to be dropped at the corner of King and Centre St., Oshawa. How much more Ontario local can you get than that! One of the many challenges offered by going by bikes and transit, is the inevitability (mine) of being a bit late catching the train. Be prepared to leave early, always track a safe route to transit beforehand, and again, leave early! All that’s gained from speeding to the train on your bike is danger, stress, and a very sweaty transit ticket! That being said – on this trip, for the first time, I left early to catch the GO train at the GO Danforth train station. Across the street (Main Street) is a deli and bakery you can relax at, have a snack and wait for the train a bit. Toronto west-enders: take the TTC subway to Main Street station to get to GO Danforth – they’re hardly two hundred metres apart. Bring a credit card for the easiest way to buy a ticket, but don’t buy a return fare – because you never know which Durham GO station you’ll be returning from. 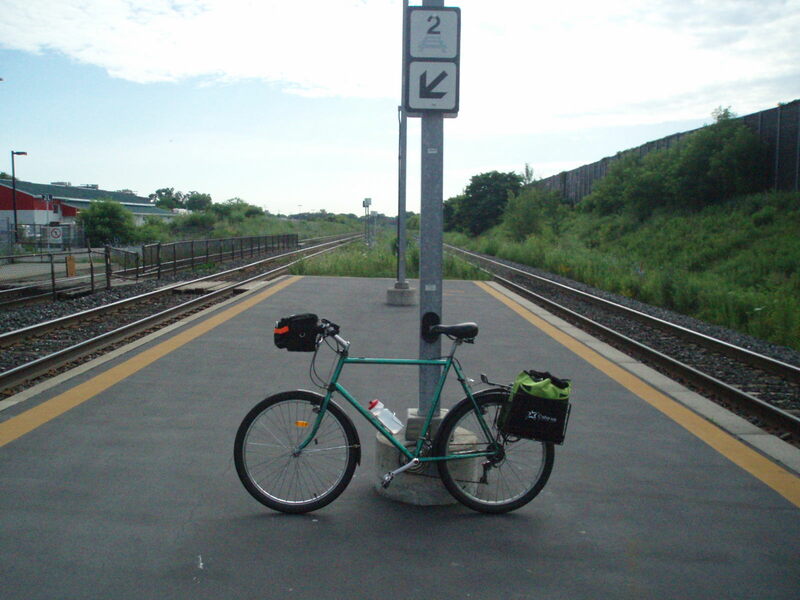 This day I was riding to the Oshawa waterfront then west to the Whitby GO train, but it’s just as easy to continue along the Waterfront Trail west to the train at Pickering, or to turn north up the Trans Canada Trail along Duffins Creek to get to the Ajax GO station. The first time getting on the train with your bike is a bit nervy, but alas, it never fails. Just wait for the doors to open and the passengers to get off and on. Lift your bike and step up into the train. The bike will fit past the bar in the doorway, though big handlebars need a bit of steering. Even travelers with bikes laden with panniers, tents and sleeping bags can rest assured their bikes will fit in – with just a little push. 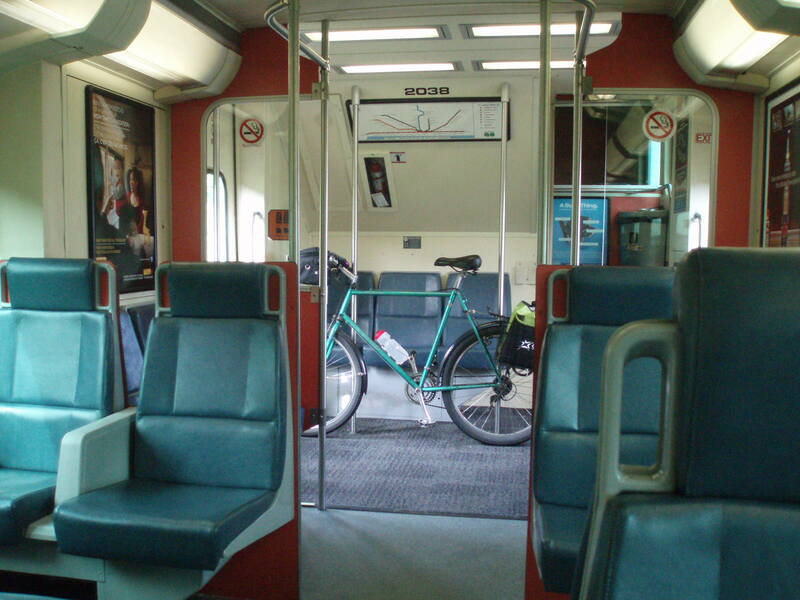 Once on the train, lean your bike against the metal poles just inside to doorway. Lock it, or don’t – But, be sure to take a seat upstairs on the train, on the south side, for the best views of Scarborough/Pickering’s Rouge River marsh, beach and waterfront. At the train station it was simple to transfer with bike to the GO bus. Take all your gear off and bring it inside the bus. Put single bikes on the back of the rack, then get on and relax. Forgot to mention: going east, get on at the front of the train – the GO bus stop (and VIA station) at Oshawa is at the very east end at Oshawa. I asked the bus driver to tell me when we got to King and Centre, but I also had my smart phone to track when I was approaching the downtown bus stop. 10 minutes (10 minutes!) from the train, and I was at the corner with my bike, greeted by Dewan. It was just 1 hour and three minutes from the Danforth GO station. And only a 1 hour and 30 minutes since I left home. I hit the corner coffee shop to fill up my thermos and get some muffins, while Karim spoke with a reporter I’d arranged from the Oshawa Express. Karim is a passionate spokesperson for the great potential for urban cycling in Oshawa. 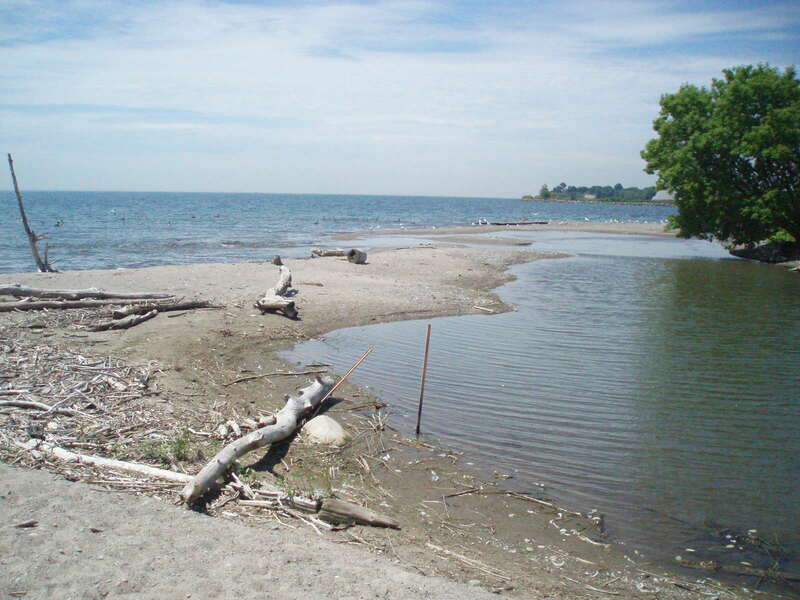 As a member of the city’s transportation staff he was able to get away from the office for an hour or two to show me the Oshawa Creek Trail trailhead (S/W corner, just behind the Scotia Bank) and bike with me down to the Lake. 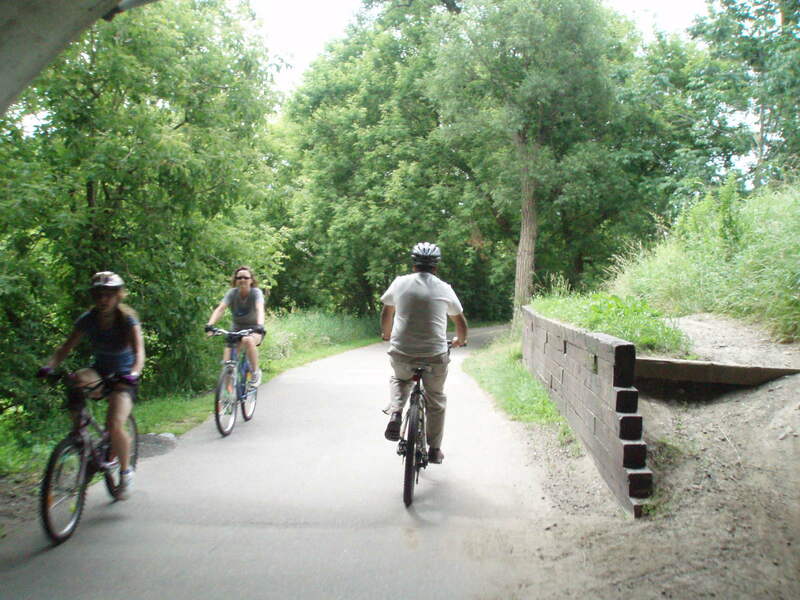 Before I know it, we were whizzing our way south on excellent, and wide, asphalt bike paths right along the creek. “You should come back when the salmon return,” said Karim. “It’s quite a sight, the kid’s scream when they see them heading upstream.” I can only imagine. One of the best things about Durham municipal trails like the Oshawa Creek Trail, and anywhere along the Waterfront Trail, is that they are well signed. Karim and I breezed along for five kilometres, and soon found ourselves at Lake Ontario, then heading east to Oshawa’s Second Marsh. 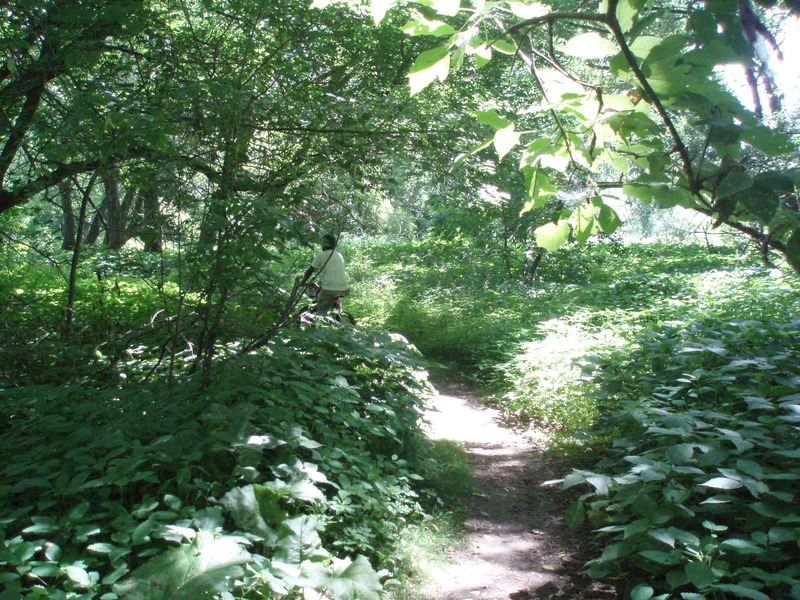 A (lucky) missed turn, and we were cycling a seemingly abandoned nature path of overgrown weeds to the east side mouth of the creek. Everywhere a stream meets Lake Ontario is an amazing site (and nothing rivals where the Rouge River meets Lake Ontario) but this natural landscape at the mouth of Oshawa Creek is something to behold. We then split up – with Karim biking back to work, and I back to mapping the 10 kilometres of waterfront east to Darlington Provincial Park. Just inside the Park’s west gate is a great shady spot to stop and have a picnic. Be sure to bring lots of food and water along, as there’s little available at times on bikes and transit rides like these. 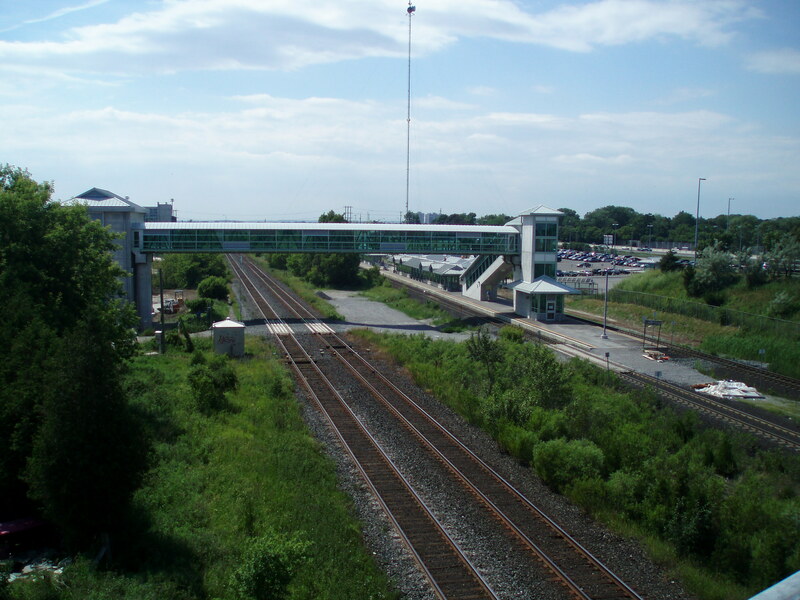 One should also come to Darlington sometime to camp, with the Whitby GO train station a great launching point. 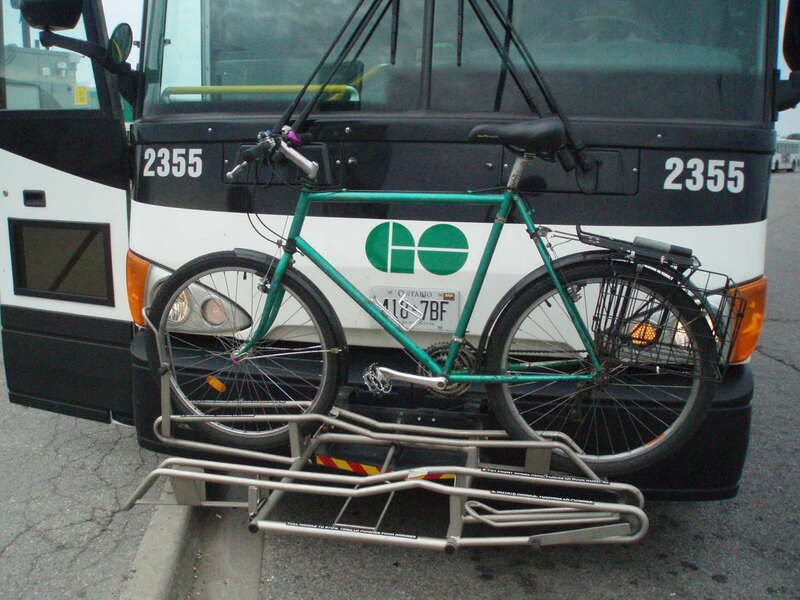 You can also safely catch Durham Transit Bus #3 (with bike rack) from the Oshawa GO train station south to the Waterfront Trail, and cycle east to the campground. 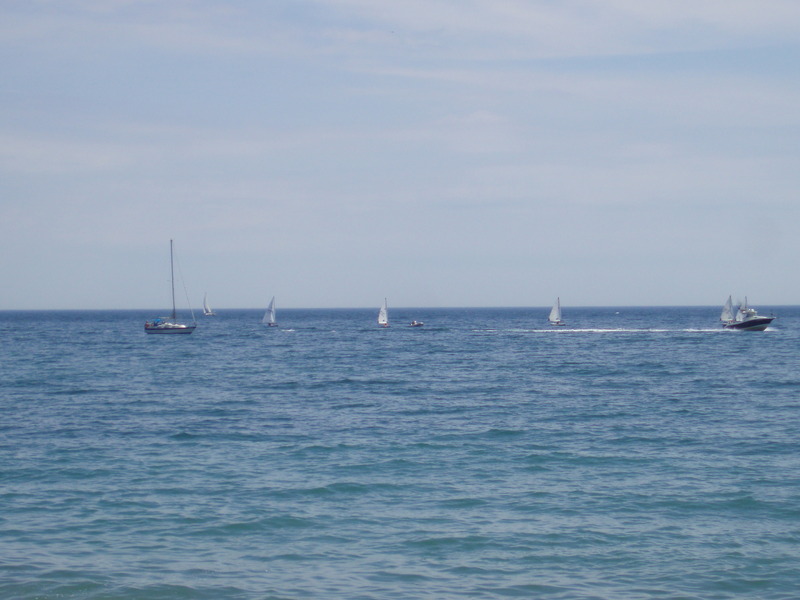 The ride west is an easy 20 kilometres to the Whitby waterfront and nearby Whitby GO train home. Print up Waterfront Trail Maps to bring along always. As a backup, there’s great signage and WFT map tableaux the length of the Durham coast. 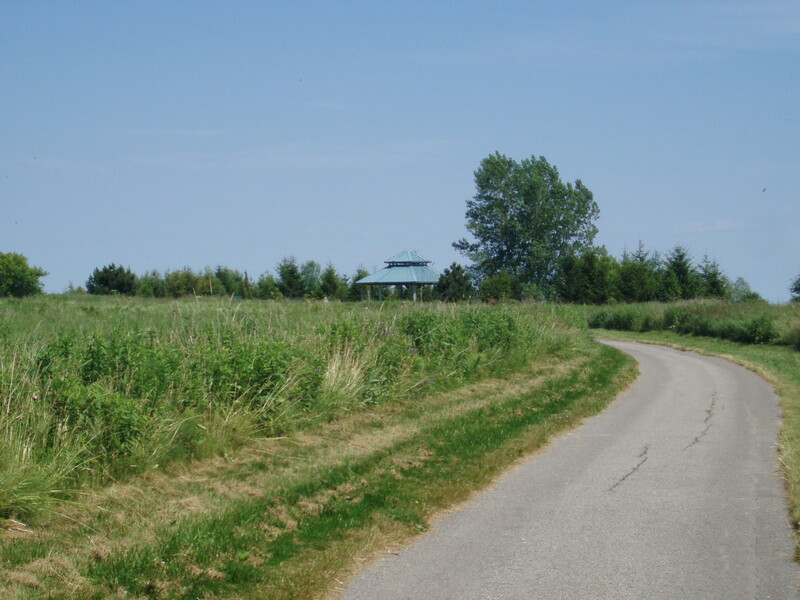 The ride is a mix of asphalt and gravel trail, some grass, a lot of boardwalk and great steel bridges through the marshlands (not to mention a few interesting glimpses at 1960s Durham suburbia!). 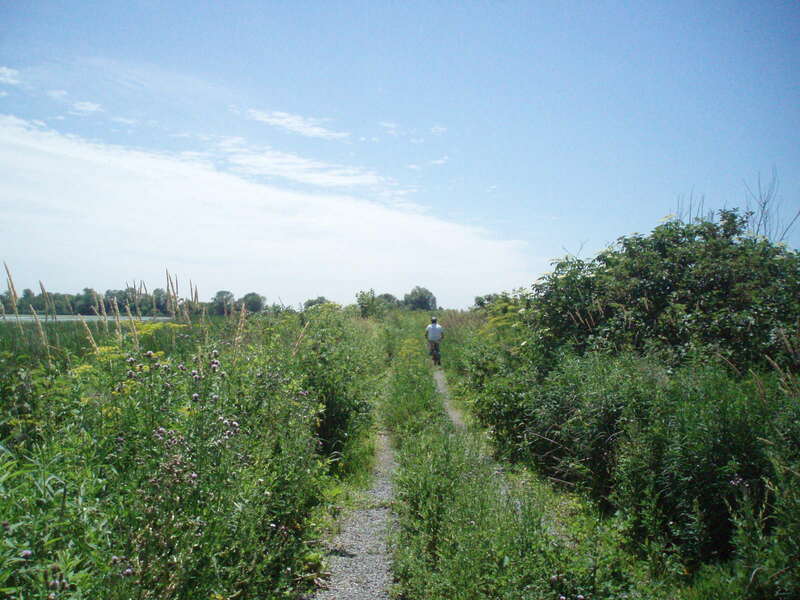 For starters heading west from Darlington, there’s the grass-based McLaughlin Bay Nature Reserve Trail. It’s well worth the rough ride, but don’t try it with tiny racing tires; any tire above 1” is fine. 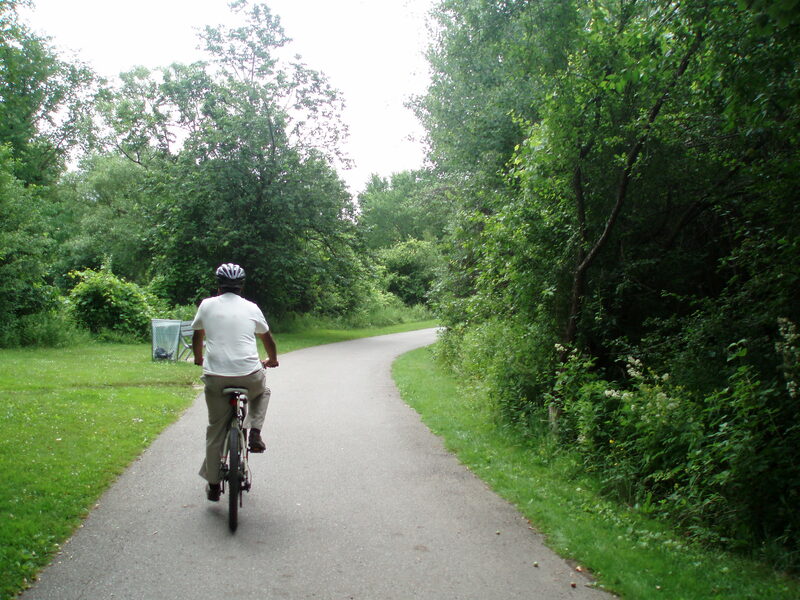 Some say Niagara is the best destination for cycling in Ontario. After one day of cycling in Durham (north, south, east or west) you’ll beg to differ. A daytrip to Oshawa by bikes and transit is an unforgettable experience, with an abundance of wildlife, a close up look at how our creeks and marshes filter our water, and a strong impression of why it’s so important that we do our best to help nature out – and protect these vital natural features upstream and down. Before I knew it my day was closing and I was approaching the landmark Thickson’s Point gazebo on the Whitby lakefront. The eastbound winds are always predominant, but to compensate there’s that lovely Durham waterfront state of mind (trance?) you pedal into. Long grass, seabirds, sailboats and a blue blue horizon – you can’t beat it. 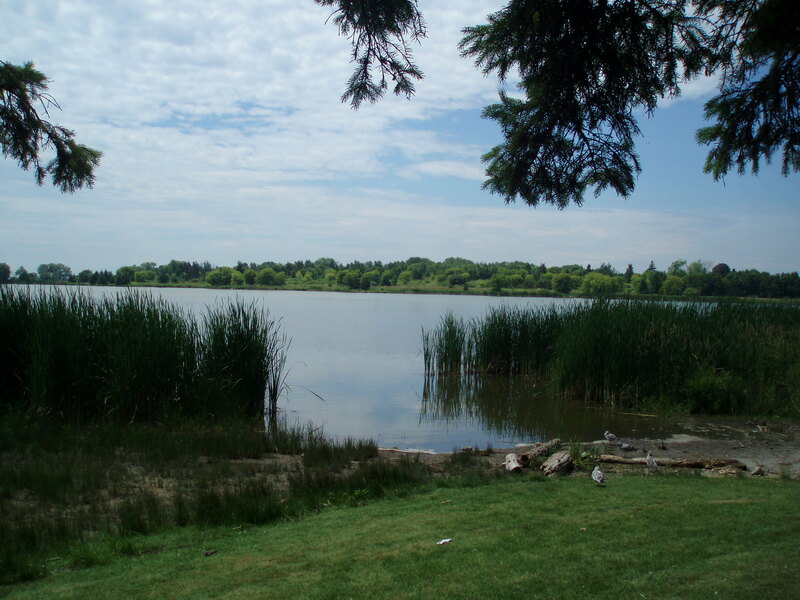 When you reach Whitby’s Lake Park and nearby marina on Liverpool Road you’ve reached the end of the day’s 35 kilometre bike ride (or you’re halfway to Pickering!). Head up Brock Rd. hardly a kilometre to the Whitby GO train and bus station. 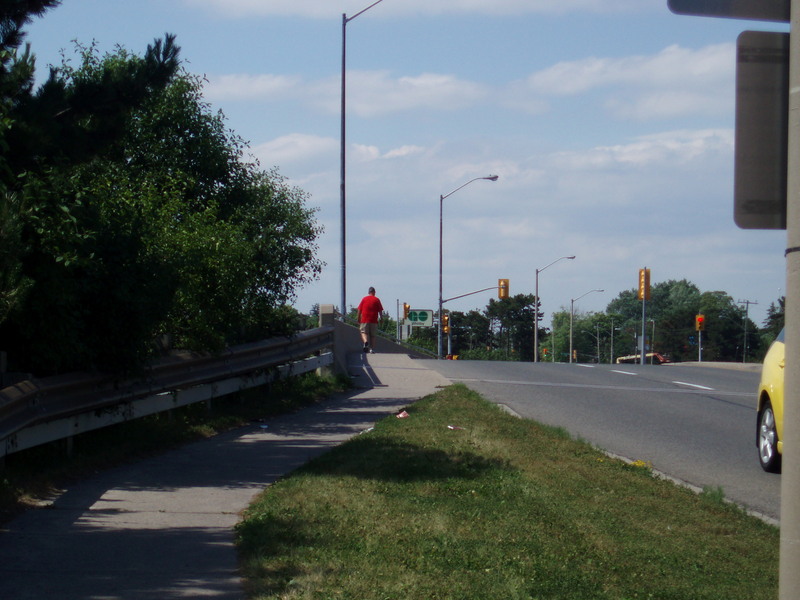 At Victoria St. W, best to cross to the west side and take the sidewalk over the 401 to the GO. If you’re early, hang out there at Victoria St. under the shade trees by the church on the N/E corner. Again, a surprisingly inexpensive transit ticket awaits, at the counter or the ticket machine, and you’re back on the train home. Cycling’s great – but at the end of the day, oh so’s the train!